In Society 5.0, new value can be generated in the following ways: through AI analysis of big data consisting of diverse information, such as observations of disaster-affected areas by satellite, by terrestrial weather radar, or by drones, damage information based on structural sensors, and road-damage information from automobiles. 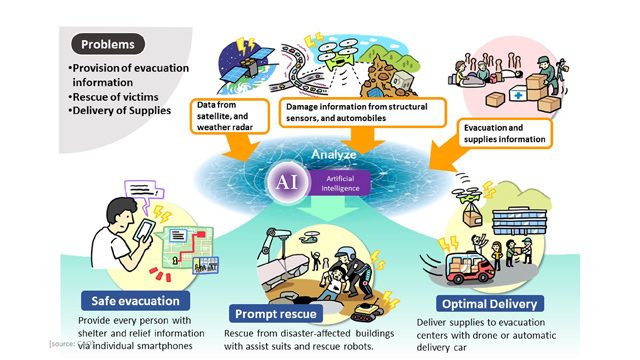 ・Perform optimal delivery of relief materials through drones, self-driving delivery vehicles, etc. For society on the whole, these solutions can help reduce damage and achieve an early recovery.